A progress update on the building of the second generation Noux IOM - by Olof GinstrÃ¶m and Anders Wallin. One problem with the current IOM class rules is that proper event measurement requires the use of a cumersome and not very accurateÂ measurement tank to check for the overall depth and hull depth. During the winter Olof GinstrÃ¶m came up with this jig to do the job - here are some pictures and comments from the first trials. 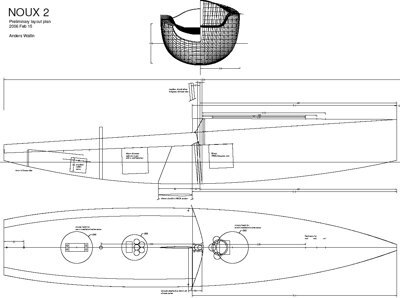 An updated layout plan for the Noux-2 with the winch placed under the foredeck and a circular theme for the hatches. There's also been a request for a 3D IGES model for the Noux-2 so here it is. Finally decided to make some proper rudder moulds for the Noux. 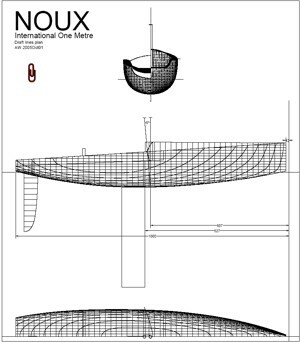 This design, based on the rudder a number of Noux boats have been using for 1-2 season, was chosen. It's a simple(based on a Marblehead rudder by Bob Sterne actually) moderately deep rudder with a fairly thin section (just enough to accomodate a 4 mm rudder stock). Below some pictures from the CNC milling of aluminium moulds. Draft lines plan for the Noux. 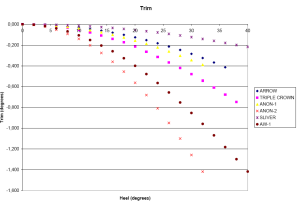 A bit of hydrostatics data for some hulls I happen to have in my CAD program. Since publishing the bulb mould plans there has been a couple of requests for a drawing of only the bulb. Here it is. It's a round cross section 350mm long NACA 0010-34 bulb. I'm using a feature of Adobe Acrobat 6.0 to attach a DXF version to the PDF file. Open the PDF in acrobat reader and access the DXF by right-clicking on the paper-clip on the right and choose "save embedded file to disk". 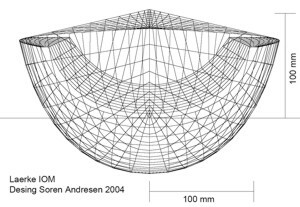 SÃ¸ren Andresen (DEN) sent me the plans for his own design with which he won the 2005 Nordic Championship and placed 2nd in 2004. He also sailed it into 35. place in the 2004 Euro Champs in Arcos/Spain. 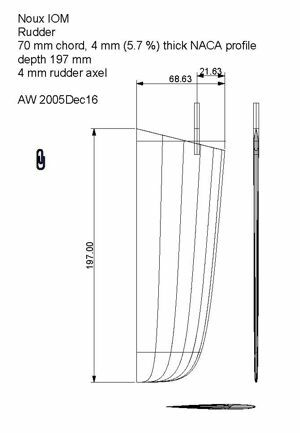 The PDF file contains the sections and a drawing with the mast and keel positions but you should really download the DXF file and printout accurate sections with a CAD program if you want to build the boat. SÃ¸ren Andresen (DEN) uses this interesting arm winch setup on his boat. The idea is that by attaching the jib and mainsheet at different points wrt. the block on the arm you can get unequal travel on the sheets. 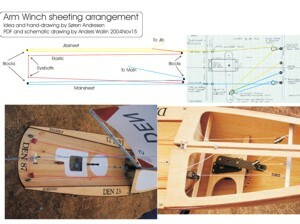 As shown here the mainsail can be adjusted virtually independently of the jib sheet when close hauled. Getting the leech points correct when building a mainsail can be quite challenging. 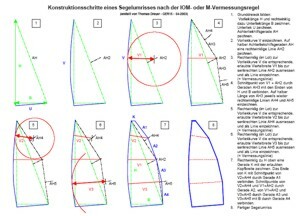 Thomas Dreyer(GER) emailed me with this drawing+text about how to get the geometry correct when you are building an IOM (or M) mainsail. Lester Gilbert has a similar kind of drawing at his site: "Measuring an IOM Mainsail"